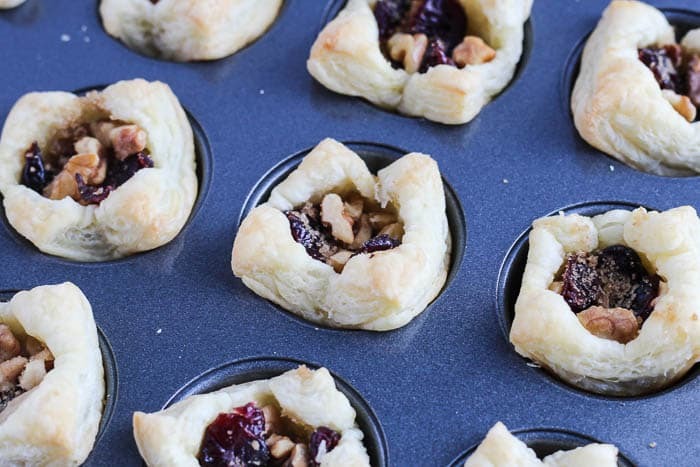 These Mini Cranberry Walnut Cups make a delicious appetizer or treat for the holidays! 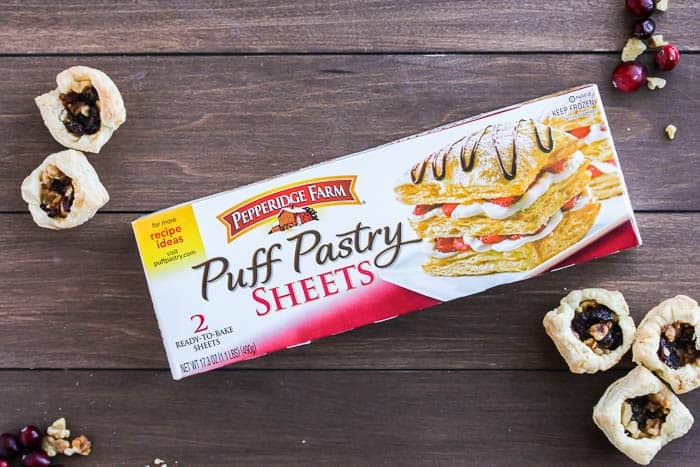 For this recipe, I use Pepperidge Farm® Puff Pastry. In addition to the fact that Puff Pastry Sheets are absolutely delicious, they are incredibly versatile as well! I love how these convenient, frozen sheets of pastry transform into golden, flaky layers when baked! I use them often in both sweet and savory dishes, and in recipes for every meal of the day! 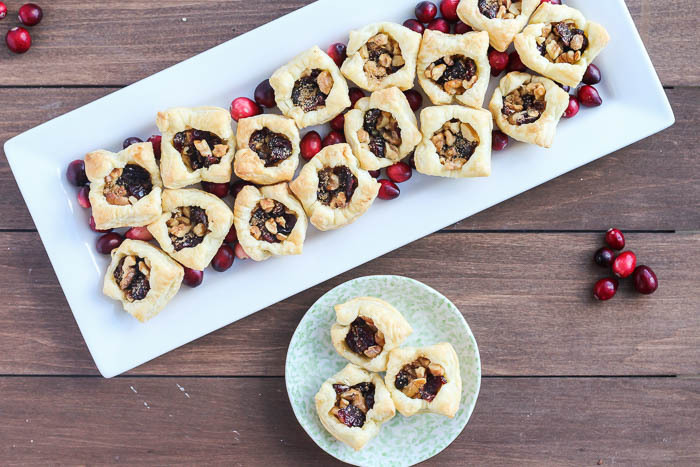 They definitely helped to make this recipe for Mini Cranberry Walnut Cups Pinterest-worthy! 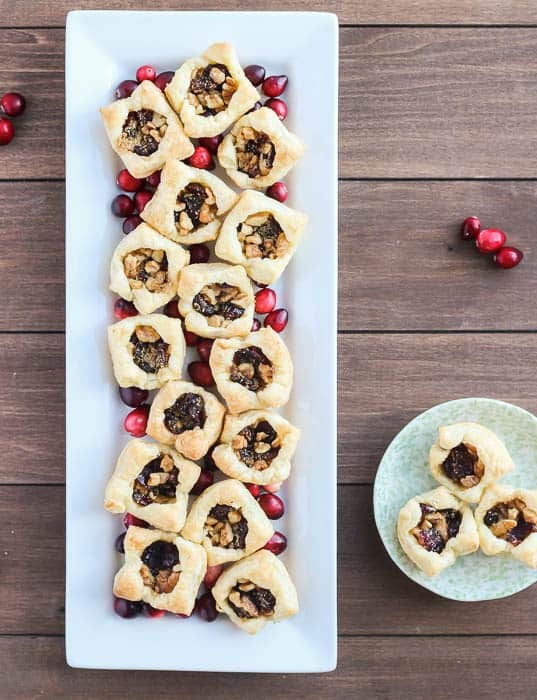 I’d say that this Mini Cranberry Walnut Cups recipe is my favorite holiday recipe, but I really love them all! 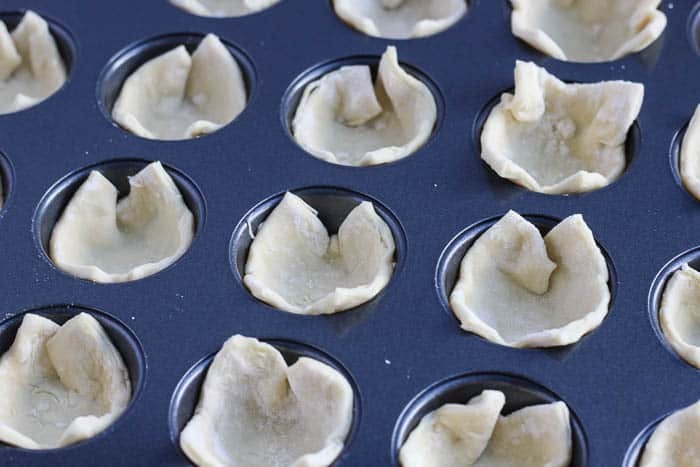 These tasty little pastry cups are, however, the cutest! In addition to the sweet, nutty flavors, I really love that these are the perfect recipe for holiday entertaining! You can set them out as a finger food or appetizer before dinner, or after dinner as a mini dessert! 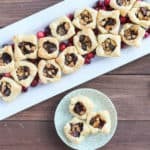 They are obviously ideal for Thanksgiving and Christmas, but try them at your next home-gating party, or birthday celebration and I’m sure they will still be a hit! As always, the best part is that this is a super easy recipe to make, freeing up more of your time to spend with your loved ones! You will need to set out the puff pastry to defrost for about 40 minutes before you begin. 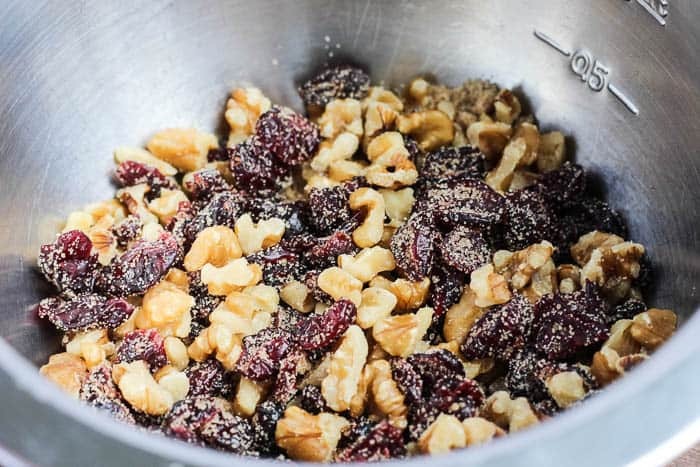 In a small bowl, combine the dried cranberries, chopped walnuts, brown sugar, and cinnamon if you are using it. 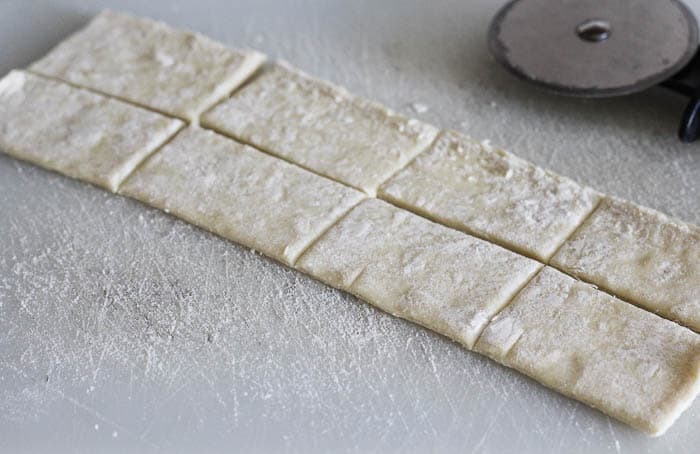 Cut your Puff Pastry Sheet into 24 small squares (they may look like rectangles but you can stretch them). Using a mini cupcake pan, place one Puff Pastry square into each well. You can stretch the dough a bit if you need to. Add 1 heaping teaspoon of the cranberry mixture to each cup. Bake 12-15 minutes, until the puff pastry is just golden. If the filling is spilling over the tops, you can use the back of a spoon and press it into the cups – the pastry will collapse in some. 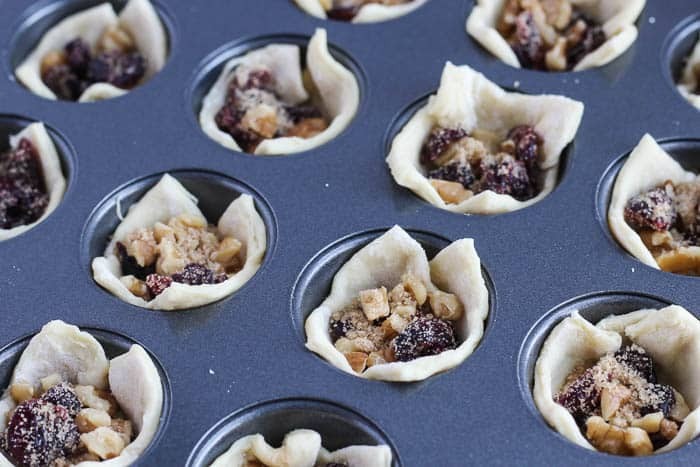 I like to place these Mini Cranberry Walnut Cups on a serving tray and add fresh cranberries around them. I think sugared cranberries would also be really pretty to use, if you have them! 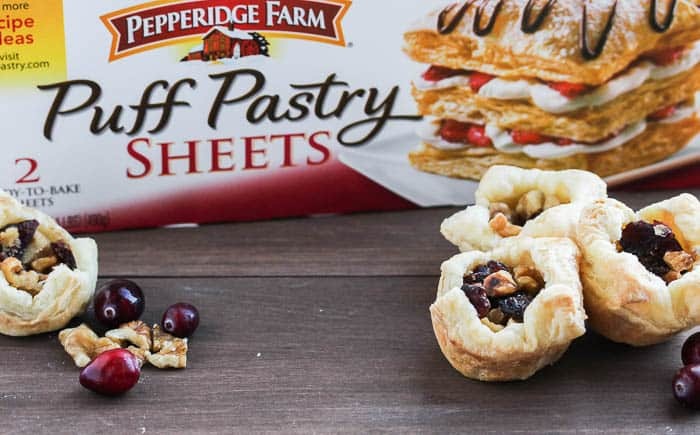 For more Puff Pastry recipe inspiration, check out the Pepperidge Farm® website and their Pinterest page! ** You will need to set out the Puff Pastry Sheet to defrost for about 40 minutes before you begin. In a small bowl, combine the cranberries, walnuts, brown sugar, and cinnamon if you are using it. Cut your Puff Pastry Sheet into 24 small squares. Using a mini cupcake pan, place one Puff Pastry square into each well. You can stretch the dough a bit if you need to. Add 1 heaping teaspoon of the cranberry mixture to each cup.